You can set up Binary Authorization in your environment in a single-project configuration or a multi-project configuration. A single-project configuration is mostly useful for testing or experimenting with the service. This tutorial shows how to configure and test a policy in Binary Authorization where all deployment resources are located in a single project. In this tutorial, the policy requires an attestation from an attestor in order for a container image to be deployed. The steps below describe tasks that you perform from Google Cloud Platform Console, as well as some tasks you perform using gcloud commands. To perform these steps using gcloud, see Getting Started Using the CLI. Use the Pricing Calculator to generate a cost estimate based on your projected usage. New Cloud Platform users might be eligible for a free trial. In the GCP Console, go to the Manage resources page and select or create a project. Enable the Container Registry, Container Analysis and Binary Authorization APIs. Install GnuPG 2.0 or later (gpgv2) for PGP key management. where PROJECT_ID is the name of your project. Now you can create a GKE cluster with Binary Authorization enabled. Here, you create a cluster named test-cluster in the GKE zone us-central1-a. Visit the GKE menu in GCP Console. Enter test-cluster in the Name field. Select Zonal in the Location Type options. Select us-central1-a from the Zone drop-down list. In the Security section, select Enable Binary Authorization. You must also update the local kubeconfig file for your kubectl installation. This provides the credentials and endpoint information required to access the cluster in GKE. A policy in Binary Authorization is a set of rules that govern the deployment of container images. You can have one policy per project. By default, the policy is configured to allow all container images to be deployed. Go to the Binary Authorization page in the Google Cloud Platform Console. In the Policy tab, click Edit Policy. In Project Default Rule, the option Allow All Images is displayed. An attestor is a party that is responsible for attesting that a required process has completed before a container image can be deployed. This party can be a human user or, more often, a machine process like a build and test system, or your continuous integration (CI) and deployment (CD) pipelines. For this tutorial, you have one attestor named test-attestor and a Container Analysis note named test-attestor-note. In a real-world scenario, you can have any number of attestors, each one representing a party that participates in the authorization process for the image. For a multi-project configuration, you must set permissions on the Container Analysis note as described in Multi-Project Setup. This is not required in a single-project scenario, because the project has the required roles/containeranalysis.notes.occurrences.viewer by default. Binary Authorization uses cryptographic keys to securely verify the identity of attestors. This ensures that only verified parties can participate in the authorization of a container image. The key pair consists of a private key, which the attestor uses to digitally sign attestations, and a public key, which you add to the attestor as stored by the Binary Authorization service. In this tutorial, you use PGP cryptographic keys. However, you can also use PKIX keys as an alternative. The asymmetric keys generated and stored by Cloud Key Management Service (Cloud KMS) are PKIX-compliant. See Creating attestors using the Console for more information on using PKIX keys and Cloud KMS. where PUBLIC_KEY_FINGERPRINT is the version 4, full 160-bit fingerprint, expressed as a 40 character hexidecimal string, such as ABAB2098B3F5F05FF0D12ABE45895BDDDCD17B90. See the OpenPGP RFC for more information on PGP fingerprints. The exported public key is located in /tmp/generated-key.pgp. The private key is stored on the local system where you ran the gpg --gen-key command. 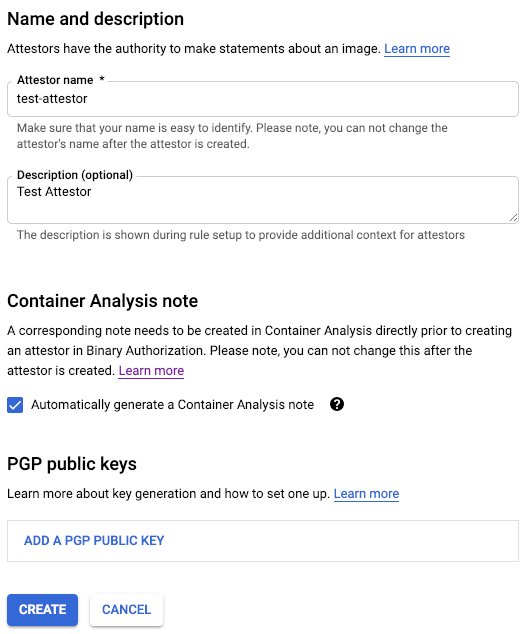 Now you can create the attestor itself in Binary Authorization and associate the PGP public key that you created. 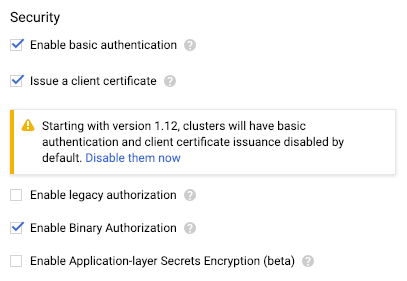 Return to the Binary Authorization page in the Google Cloud Platform Console. In the Attestors tab, click Create. Enter test-attestor in the Attestor Name field. Enter projects/PROJECT_ID/notes/test-attestor-note in the Container Analysis Note Name field. 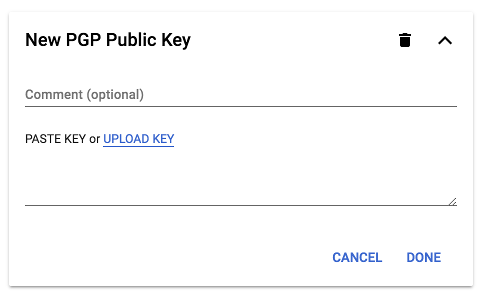 Click Add a PGP Public Key. Open /tmp/generated-key.pgp in a text editor. This is the public key file that you created in the previous step. Copy the contents of the file to the Paste Key text box and click Done. 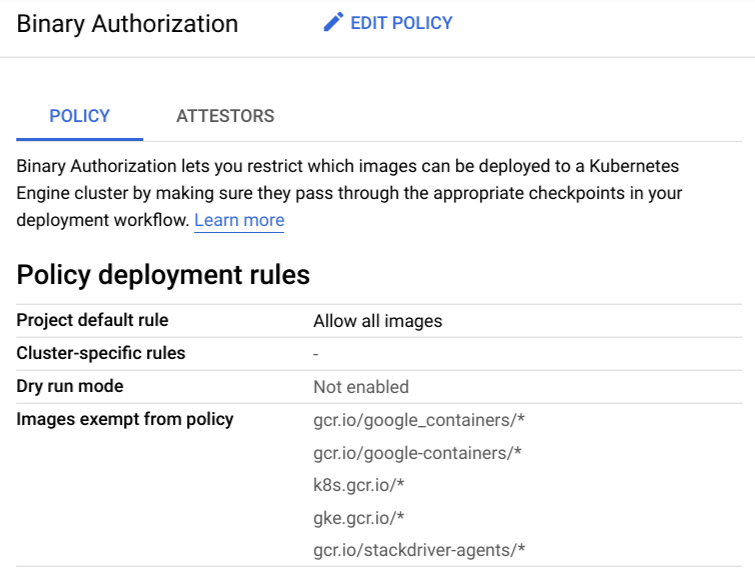 Return to the Binary Authorization page in Google Cloud Platform Console. Select Allow Only Images That Have Been Approved By the Following Attestors. Enter projects/PROJECT_ID/attestors/test-attestor in the Attestor Name field. For more information, see Configuring a Policy Using the Console. You can test the policy you configured above by trying to deploy a sample container image to the cluster. The policy will block deployment because the required attestation has not been made. For this tutorial, you can use the sample image located at the path gcr.io/google-samples/hello-app in Container Registry. This is a public container image created by Google that contains a Hello, World! sample application. An attestation is a statement by an attestor that a required process in your pipeline has been completed and that the container image in question is authorized for deployment. The attestation itself is a digitally-signed record that contains the full path to a version of the image as stored your container image registry, as well as the identity of the attestor. In this tutorial, your attestation simply states that you authorize the image for deployment. "type": "Google cloud binauthz container signature"
The signature file is a digitally-signed version of the payload JSON file you created above. where FINGERPRINT is the public key fingerprint that you found in Generate a PGP key pair above. For more information on creating attestations, see Creating Attestations. Again, test the policy by deploying a sample container image to the cluster. 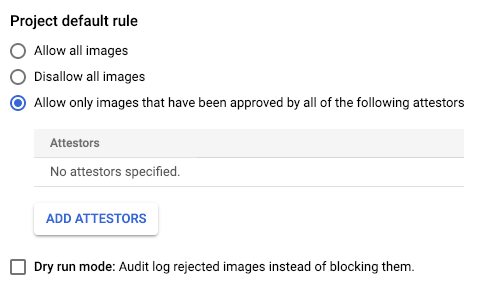 This time, you must deploy the image using the digest rather than a tag like 1.0 or latest, as Binary Authorization will use both the image path and digest to look up attestations. Here, Binary Authorization allows the image to be deployed because the required attestation has been made.